An outdoor kitchen can be a great do it yourself project . It can be bit challenging but once it sits there on your backyard, your heart will swell with pride every time you barbecue on it! What's more, you can save a lot on contractor fees and at the same time put your creativity to test. A typical project will take about 50 hours of your time. Include additional time to go the market and get supplies, plans and kits. You could put the requisite number of hours in one go or put in chunks during weekends for whenever you have free time. For hassle free construction follow these 8 simple steps to get the maximum from your outdoor kitchen. Remember the famous Dwight Eisenhower quote 'Plans are nothing; planning is everything'. The more thought and research you put into the planning stage, the better the end product will be. Make sure to write everything down on paper. A vague concept in mind only leads to confusion later on. Be specific. Get your family together and chalk out your following requirements. What type of cooking you would be doing and how often. Are you a high end griller living in California, Florida or Texas or a low end griller who cooks out occasionally on Memorial Day, Fourth of July and maybe Labor Day? Will you have the food outside or intend to bring it inside to eat. Whether you are designing the outdoor kitchen for a small family or are planning to use it as a place to host party gatherings. The furniture that needs to be used with the design. The time of the year you will be using the outdoor kitchen most often. 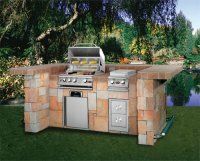 Whether you want the outdoor kitchen to be a flexible, movable arrangement or do you want it permanently installed. After diligent planning you would graduate to the next important consideration: choosing a good location. If you have a large backyard make sure to have the kitchen closer to the house as inevitably you will have to go to and fro for supplies. 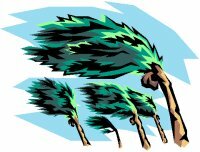 Another important tip is to know which way wind blows. The smoke from the grill should not go towards the eating table. Additionally if the grill is placed in a shaded area, make sure the smoke can escape easily. Trapped smoke blackens walls and surrounding structures over a long period of time. A good self made outdoor kitchen can easily be built in under $7000. This includes a high quality grill, a kitchen island ,countertops and flooring. If you plan to make a patio along with roofing your budget could be considerably more as contractors will take their fees. Before designing or getting a plan for an outdoor kitchen it is a good idea to make a list of equipment you might need. Rather than buying a grill after you make a grill island go the other way round. Select the grill you want and make the island around it. Also consider all the accessories you may need including sinks, cabinets, outdoor refrigerators, access doors and others. Before rolling up your sleeves get a plan. There are many books and step by step kits available in the market. To make things even simpler DVDs describing the entire process of making the kitchen are available. Your local building officials may require a building permit for an outdoor kitchen. Bring a copy of your property survey, a map that shows where your property lines are. The building department will ask that everything be thoroughly documented, from the wiring and plumbing to the construction specifics of structures such as patios. You shouldn't feel disappointed if the permit is declined, it happens to the pros also. Simply do the modifications as suggested by the department. You might have some hard work in store. Take it as fun and slowly. Rushing through the project will only tire you. Get your family involved and work as a team. Avoid building the kitchen during rains. It makes a lot of mess! Your DIY outdoor kitchen would look a little unsophisticated in the beginning. Now is the time to work on aesthetics. Lay flooring that complements the overall surrounding. Choose umbrellas, get a fire pit, and install lights on grill, get a basket or two to keep on the countertops and decorate with plants. You would be amazed with what you built! Use materials that require little maintenance. You want surfaces that are easy to clean, require little or no paint, won't rust and are immune to weather damage. Suggested materials are masonry, stainless steel, pressure-treated lumber and outdoor-rated tiles.